Contact us if looking for top of the line quality Liquor PET Blow Moulding Machine! The Liquor PET Blow Moulding Machine that we deal in is sturdy in construction and assures longer service life. 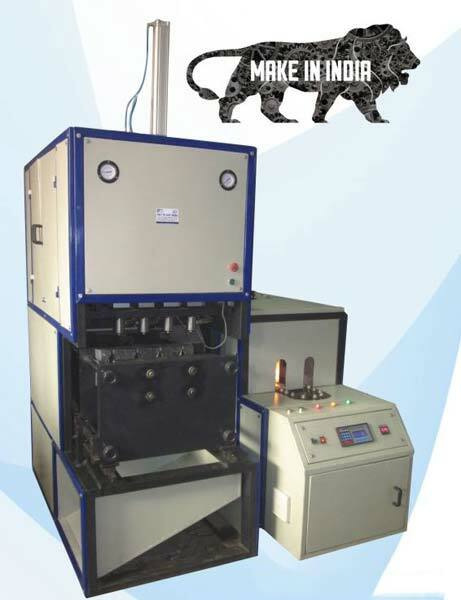 We are counted amidst the top most Manufacturers and Suppliers of Four Cavity Auto Drop PET Blowing Machine from Haryana, India. As far as the price is concerned, we offer Liquor PET Blow Moulding Machine to you all at the modets prices. Fully Pneumatic, Toggle system based, linear Rail guide movement and many more. All These Features Make the machine to Reduce production cost to 10 Paise / Bottle * in comparison to 40 Paisa / Bottle* in fully automatic machine. Government of Bihar has taken an important decision to replace from pouch packaging to Pet bottle Packaging of country liquor in 17 Bottling Plants, because of its above mentioned benefits. We Pet Plast India proudly say that in 10 out of 17 bottling plants in bihar approximately 4 Million bottles / day are being produced on our machine, which is about 60% of total production of pet bottles in liquor industry of bihar, which directly resembles how much successfully this development is. We are sure that this machine is going to be a revolution in pet blow moulding industry for its cost effectiveness and the people involved in liquor industry are going to appreciate this development. This machine is also recommended for mineral water and edible oil industries for mass production.